Last February, when I visited the Smithsonian National Museum of Natural History in Washington, DC (recall my “What makes us human?” post), I noticed that there was a documentary titled ‘Arabia’ playing in the IMAX theater. I made a mental note of it and went to the ‘human origins’ exhibit. The “documentary” later opened in theaters across the US in 3D and lush cinematography, though it didn’t play in my part of the world. When I got a chance to watch it, on my small laptop screen, without the benefit of 3D and immersive effects, I understood why it wasn’t released here: this was made purely for western audiences, indeed quite specifically for Americans. This fancy and clearly expensive 45-minute feature, which I’m describing as a “documercial” (hybrid between documentary and commercial), aims at presenting Arabia (read: Saudi Arabia) as a land with at least 2000 years of rich history and one which is now progressing in a balanced way between tradition and modernity. It wants to dispel stereotypes about Saudis being US haters, backward-thinkers, oppressors of women, etc. I don’t know what the budget of this project was (several million dollars, I would guess, considering the lavish production, the under-water filming, the animations, and the special effects), but the feature was narrated by Helen Mirren, directed by Greg MacGillivray, with music by Steve Wood and some contribution by Yusuf Islam, a.k.a. Cat Stevens, though I couldn’t find any references to two beautiful Arabic songs performed at various moments. On the other hand, the credits do tell us that the feature was produced in association with the Royal Geographical Society, the Oxford Centre for Islamic Studies and the King Faisal Center for Research and Islamic Studies. Quite a stellar group for a 45-minute documentary. Which golden ages are they talking about? The first one is the Nabatean civilization which flourished in the Arabian Peninsula some 2000 years ago, the most famous and stunning example of which is the town of Petra in Jordan. Hamza tells us that another Nabatean town, Madain Saleh, which was only discovered in 1876 in the northern region of Saudi Arabia, was part of that first “golden age”. Then, the Nabateans harvested and sold frankincense to the Romans, who used it to perfume the gods in their temples, thereby achieving great wealth. Their contacts with the Romans and the Greeks, as attested to by the coins found in the ruins, allowed them to learn architecture and masonry and thus build stunning stone edifices (the Petra treasury building, the Madain Saleh tombs, etc.). But when Romans adopted Christianity, frankincense was no longer needed for any gods, and the Nabatean “empire” collapsed, or so we are told. In fact, I was surprised to hear such an erroneous statement as “Prophet Muhammad spent much of his life in Medina” (he spent the last 10 years of his 63-year-long life there). Then the documentary jumps to the twentieth century and turns into a commercial for the Kingdom of Saudi Arabia, presenting a short history of its emergence (through the unification of a large part of the Arabian Peninsula by King Abdelaziz ibn Saud). It also strongly emphasizes the special relationship between the KSA and the USA, first through the agreements made by Ibn Saud with Roosevelt as soon as huge oil reserves were discovered (by Americans) and then the long strategic alliance between the two countries in the last half century. Finally, the documercial turns to education and insists that it is the first priority of the Saudi government and that such a great transformation is taking place that one can expect a new golden age! Women too are presented as playing an important role in the Saudi society, through their family and teaching roles and even in “higher positions within the government”. At no moment are the constraints placed on women in the KSA ever mentioned; never do we see a face-covered woman; in fact all women are nicely dressed, always smiling and talking confidently, and in all scenes women are seen with men, never segregated. So, to sum up, this was a pretty picture, nice to look at but not very satisfactory if you scratched the surface and asked about a few things or exercised some critical thinking about what was being claimed. I wonder how the American audiences, who were the target of this work, will have reacted to it and to what extent it will influence their views of “Arabia”. I'm a Mexican architecture student, my last name is Fajer, which I understand has somehow an Arabic history... Or so my grandfather used to tell me, his grandfather arrived in Mexico from the Lebannon around 1890. I have always been interested in the Arabic cultures, trying to understand a bit of my family's past. Around here, in Mexico, Arabs are looked upon mostly as they are in the US, which I find very sad because Mexico was once a very important haven for Arabic immigrants. 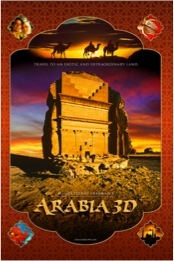 When the IMAX documentary Arabia came to our theaters I didnt hesitate for a moment in going to watch it. Even though I agree with you in your overall opinion about it, I must tell you I saw a relatively good outcome of it being watched by the Mexican audience. Most people don't make a difference between he whole of Arabia and Saudi Arabia, for them it was more of an overview of the general culture. That was somehow good because it helped reduce all the prejudice that our northern neighbors, the Americans, have planted in the western world. You must know, too, the image they sell of Mexico, as the never ending desert full of burros, drugs, and prostitutes... We do have all of those things but they're not in the least close to all that Mexico is. I hope you can read this comment and maybe issue an answer, as we share living in misunderstood cultures. 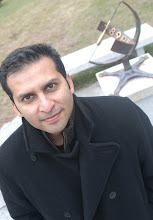 A'Salam Alaikum.